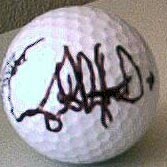 Golf ball autographed by Swedish PGA Tour player Gabriel Hjertstedt, winner of the 1997 B.C. Open and 1999 Tucson Open. ONLY ONE AVAILABLE FOR SALE. With certificate of authenticity from AutographsForSale.com.